Hello, i have a white german shepherd female, 9 months old. i havent taken her to a vet yet but i will soon. 1. Is the white coated shepherd really a more friendly or is it poor socializing that makes my dog want to jump on every stranger she spots? how should i stop that? 2. How can i know if my dog is in her heat period? and is it okay if she mates if i havent taken her to a vet yet? 3. what is the best game to play with my dog? Total German Shepherd: Congratulations on your new white German Shepherd puppy. First of all, please get your GSD puppy to a vet asap to have her checked. I assume that you haven't kept her up on her puppy shots and worming either since you haven't taken her to the vet and this is soooooo important in order to keep your maturing puppy healthy. Please make sure you ask your vet all about this too when you go and get that taken care of to help prevent her from getting a whole host of diseases - before it happens. 1. Your white GSD puppy needs dog training pure and simple. While it may not be a huge issue now just imagine if you keep letting it go how painful it could be once she's full grown and weighs 70 pounds plus! 2. I would seriously advise that you get your GSD puppy spayed as soon as possible because it has so many health benefits for her as she matures - plus you won't have to worry about heat cycles and all the hygiene issues in the future or unwanted puppies to add to the pet overpopulation problem either which is so important. I would not advise you to let a puppy have puppies - or for you to allow your dog to have puppies when you do not know what the entire process is either. This is a big thing not to be taken too lightly because you could potentially lose your dog in childbirth plus loads of other complications can occur. 3. Whatever you and your white GSD puppy enjoy the best is what I would encourage you to do together but here are a few other suggestions you might want to check out, in our fun and games section. 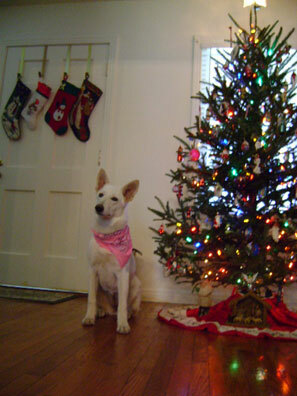 Good luck with your white German Shepherd puppy and feel free to send in some pictures to us sometime too. First of all, you must get this dog to a vet because they need shots to protect them from diseases, etc. I have had a German Shepherd Dog that was born to two GSD parents that were Black and Tan. This is not a defect in the breed it is just anyther type of the breed, there are several. You must not breed the dog on the first time they come in season and you must have her checked by a doctor. You sound very young. Please read there are tons of literature on line to help you. The dog needs training properly to learn to behave around you and strangers. If you have a question regarding the dog, just go to bing.com or ask.com and type in your question and read all they provide. There are books at a library also if you do not want to purchase them. I will be including my email address if you would like to contact me to ask me anything I can help and would be glad to. Please take good care of your GSD. She will be loyal, loving, and provide unconditional love to you endlessly.